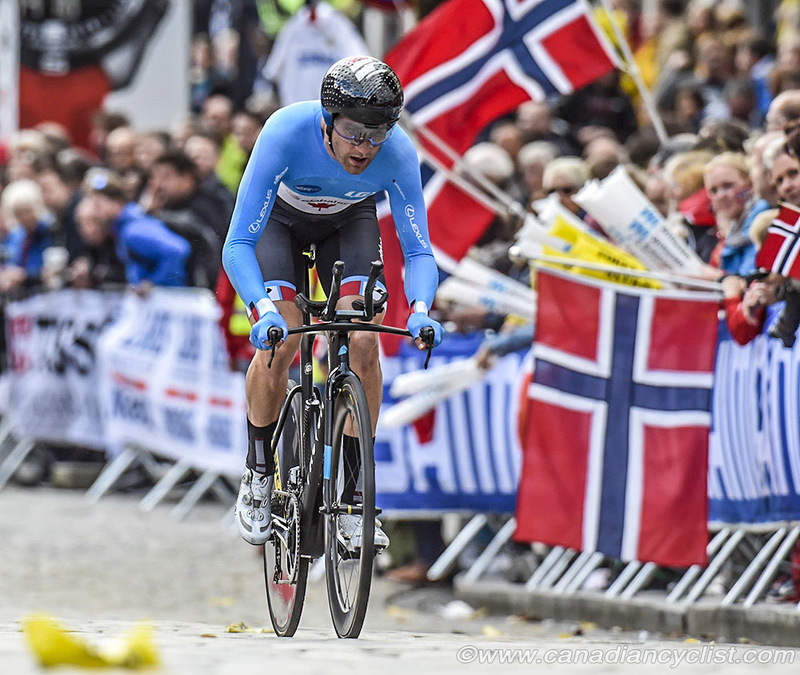 The time trial events at the Road World Championships in Bergen, Norway, concluded on Wednesday with the Elite men's competition. Hugo Houle of Sainte-Perpetue, Quebec, finished 29th against a field containing the best professional riders in the world. The unique 31 kilometre course finished with a 3.4 kilometre climb; the first mountain top finish in the history of the world championships. Houle was 38th after the first time check and then improved through the second half of the course. 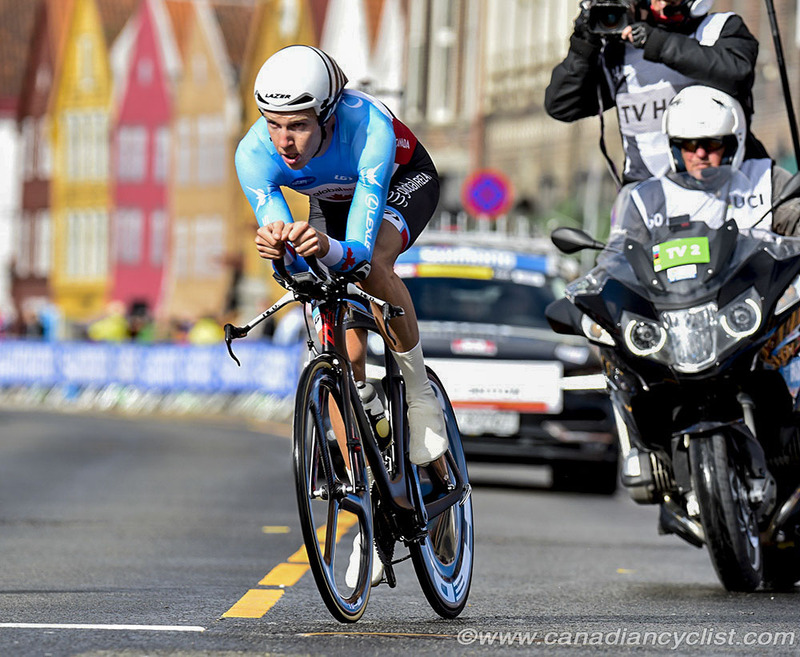 Houle completed the course with a time of 47 minutes and 47.61 seconds, to finish three minutes and 6.61 seconds behind eventual winner Tom Dumoulin of the Netherlands. Dumoulin took the lead shortly after the first split, and finished nearly a minute in front of second place Primoz Roglic of Slovenia. Chris Froome (Great Britain), this year's Tour de France and Vuelta champion, started 90 seconds in front of Dumoulin and crossed the finish line less than nine seconds ahead of him, which was still good enough for third. 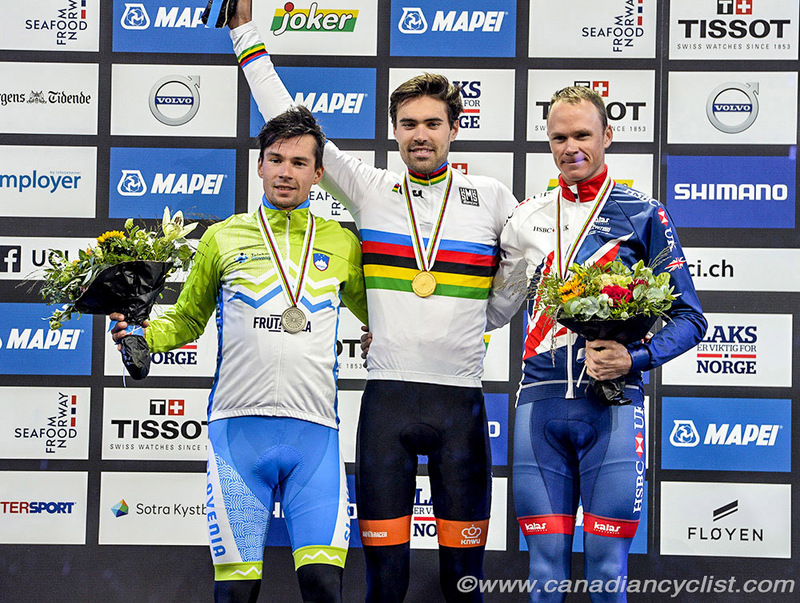 "I think I did a pretty good ride, and I tried to go fast from the start," said Houle. "It was a pretty fast course for the two laps [before the climb], and you need to manage your effort to carry your speed. Then, in the last climb, all you can do is give everything you have. I'm not there with the fastest guys in the world, but I'm working on it. The crowds were amazing today; I think it was the biggest crowd I have ever seen. They screamed so loud that they just pushed you to the line. I think I delivered a good ride and I enjoyed the experience." Canada's second starter, Rob Britton of Regina, Saskatchewan, finished 48th. "I was pretty disappointed," admitted Britton. "I think those of us who started early had the wettest conditions, so it was pretty dodgy through the corners. By the second lap it had dried up quite a bit, but overall pretty disappointed with my ride. It was a great course and I was pretty excited about it. The fans were unlike anything I have ever experienced, it was amazing." 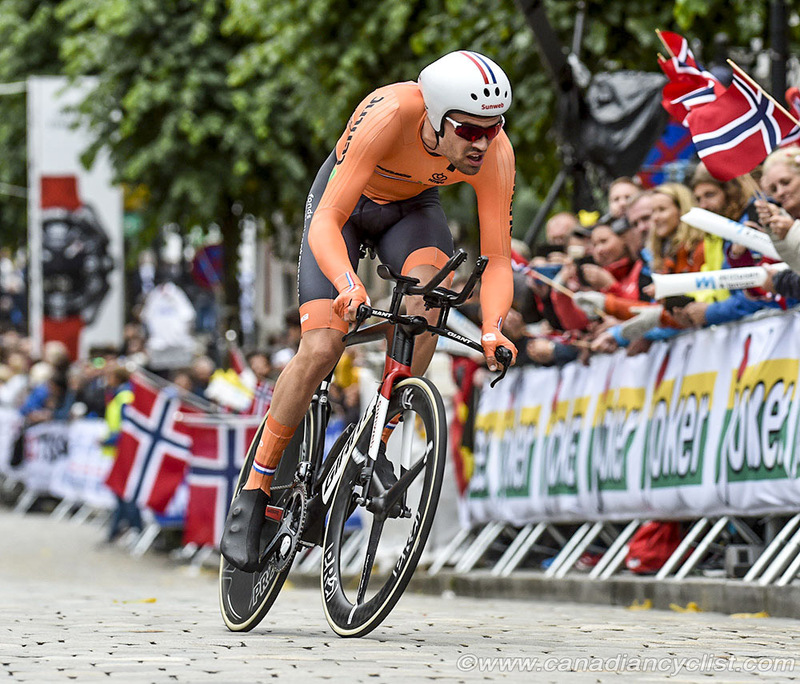 Dumoulin raced around the 31km course in a time of 44:41, posting the fastest times at each checkpoint before finishing a stunning 57s ahead of the silver medal atop the testing finishing climb of Mount Fløyen. The win once again reaffirms the success of all the hard work and time spent preparing for the discipline, with the team's coaches and experts to fine tune every detail of his effort. With a wide smile and face of excitement, Dumoulin said after the finish: “I can’t believe it, it’s really amazing! I thought my power meter was off because it was so high. I felt really, really good. After it started raining I had to take the corners really slow, especially in the first kilometre of the climb with all the twists and turns, every corner my back wheel was slipping because I had my TT tyres on, as I thought it would stay dry.